Readings: Acts 5:27b-32, 40b-41; Rev 5:11-14; Jn 21:1-14. 1/ First Reading: NAB Acts 5:27 When they had brought them in and made them stand before the Sanhedrin, the high priest questioned them, 28 "We gave you strict orders (did we not?) to stop teaching in that name. Yet you have filled Jerusalem with your teaching and want to bring this man's blood upon us." 29 But Peter and the apostles said in reply, "We must obey God rather than men. 30 The God of our ancestors raised Jesus, though you had him killed by hanging him on a tree. 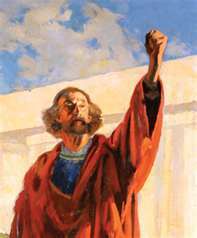 31 God exalted him at his right hand as leader and savior to grant Israel repentance and forgiveness of sins. 32 We are witnesses of these things, as is the holy Spirit that God has given to those who obey him." 40 After recalling the apostles, they had them flogged, ordered them to stop speaking in the name of Jesus, and dismissed them. 41 So they left the presence of the Sanhedrin, rejoicing that they had been found worthy to suffer dishonor for the sake of the name. 2/ Second Reading: NAB Revelation 5:11 I looked again and heard the voices of many angels who surrounded the throne and the living creatures and the elders. They were countless in number, 12 and they cried out in a loud voice: "Worthy is the Lamb that was slain to receive power and riches, wisdom and strength, honor and glory and blessing." 13 Then I heard every creature in heaven and on earth and under the earth and in the sea, everything in the universe, cry out: "To the one who sits on the throne and to the Lamb be blessing and honor, glory and might, forever and ever." 14 The four living creatures answered, "Amen," and the elders fell down and worshiped. 3/ Gospel: NAB John 21:1 After this, Jesus revealed himself again to his disciples at the Sea of Tiberias. He revealed himself in this way. 2 Together were Simon Peter, Thomas called Didymus, Nathanael from Cana in Galilee, Zebedee's sons, and two others of his disciples. 3 Simon Peter said to them, "I am going fishing." They said to him, "We also will come with you." So they went out and got into the boat, but that night they caught nothing. 4 When it was already dawn, Jesus was standing on the shore; but the disciples did not realize that it was Jesus. 5 Jesus said to them, "Children, have you caught anything to eat?" They answered him, "No." 6 So he said to them, "Cast the net over the right side of the boat and you will find something." So they cast it, and were not able to pull it in because of the number of fish. 7 So the disciple whom Jesus loved said to Peter, "It is the Lord." When Simon Peter heard that it was the Lord, he tucked in his garment, for he was lightly clad, and jumped into the sea. 8 The other disciples came in the boat, for they were not far from shore, only about a hundred yards, dragging the net with the fish. 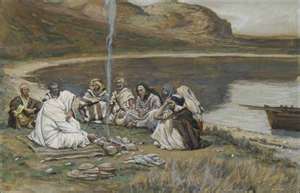 9 When they climbed out on shore, they saw a charcoal fire with fish on it and bread. 10 Jesus said to them, "Bring some of the fish you just caught." 11 So Simon Peter went over and dragged the net ashore full of one hundred fifty-three large fish. Even though there were so many, the net was not torn. 12 Jesus said to them, "Come, have breakfast." And none of the disciples dared to ask him, "Who are you?" because they realized it was the Lord. 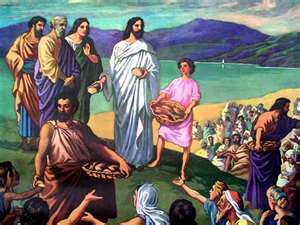 13 Jesus came over and took the bread and gave it to them, and in like manner the fish. 14 This was now the third time Jesus was revealed to his disciples after being raised from the dead. I. THEME: We must believe in God and Christ’s teaching. People are always put in situations that they must decide, either to believe in God’s or in their’s or the world’s wisdom and power. A large part of people in the past and today decide to believe in their’s and the world’s wisdom and power. Today readings give us reasons why we should believe in God’s wisdom and power. In the first reading, Peter, the representator of the apostles posed a question for the Sandherin, “Must we believe in God or in human beings?” The answer for this question is so obvious that all must obey in God; but the Sandherin didn’t answered because they were forcing the apostles to obey them! In the second reading, the author of Revelation wanted to emphasize on the wonderful results of God’s plan of salvation, and Christ is the victor of all worldly powers. He is worthy to receive all honors, glories and all praises. In the Gospel, when the apostles obeyed Christ’s instruction, they caught a great catch of fish; there are so much fish and yet the net wasn’t torn. They also received Christ’s tender love and care. 1/ Reading I: The apostles are joyful because they were regarded as worthy to be suffered for Christ’s name. When were flogged by the Sandherin, the apostles didn’t fear; but they are proud of being suffered and shared in Christ’s Passion. 2/ Reading II: "To the one who sits on the throne and to the Lamb be blessing and honor, glory and might, forever and ever." 2.1/The heavenly hymn that praises the Lamb: There are seven things which the angels praised the Lamb who is worthy to receive. (1) Power: St. Paul called Christ as God’s wisdom and power (1 Cor 1:24). (2) Riches: The source of blessings for human beings is overflowed from Christ; by him, we receive grace upon grace (Jn 1:16). The author of the Letter to the Ephesians said that the fullness of grace can’t be found anywhere except in Christ (Eph 3:8). (3) Wisdom: Christ is God’s wisdom and word (Jn 1:1-2; 1 Cor 1:24). (4) Strength: Christ has power to take away the enemy’s weapon and is victorious over Satan’s power (Lk 11:22). (5) Honor: Paul described this character the best, “Because of this, God greatly exalted him and bestowed on him the name that is above every name, that at the name of Jesus every knee should bend, of those in heaven and on earth and under the earth, and every tongue confess that Jesus Christ is Lord, to the glory of God the Father” (Phil 2:9-11). (6) Glory: Christ has the glory which is more glorious than what he had before. St. John wrote, “We saw his glory, the glory as of the Father's only Son, full of grace and truth” (Jn 1:14b). (7) Praises: Christ is worthy of all human praises because he took his precious blood to purchase for God those from every tribe and tongue, people and nation (Rev 5:9). (1) Praises: God is worthy to be praised by all because He created all things. He is the One who devises the plan to save people from sins and death. (2) Honor: Christ came to reveal God’s name for human beings; he also did all things to honor that name “I revealed your name to those whom you gave me out of the world. They belonged to you, and you gave them to me, and they have kept your word” (Jn 17:6). (3) Glory: God’s glory is also Christ’s glory in his divine nature. (4) Power: God uses Christ’s power to govern all things; especially He let Christ resurrect from death and destroy it for ever. 3/ Gospel: To do according to God’s will shall bring back results which exceed our desire. Many people wonder why Peter and other apostle went back to their former career which is fisherman after Christ’s resurrection. Is this meant they lost their faith in him or no longer have zeal to preach the Gospel? We know that St. Luke also reported the miracle of the wonderful catch of fish (Lk 5:1-11), but at the beginning of Christ’s public ministry when he called the first few of his disciples. Matthew and Mark, though not reporting about the wonderful catch, but as in Luke’s report, Christ invited Peter to become as “the fisher of men” (Mt 4:19; Mk 1:17). This report shows Luke is closed to John than to Matthew and Mark. As we are so familiar with John, the evangelist never stops at the reporting the miracle, but wants to raise his audience to a deeper level. We need to find out what is the deeper level which John wants to raise us up to it through today passage. Chapter 21 is regarded by many modern commentators as the addition either by John or by his disciples. This lesson must teach the apostles and all of us to always obey and to find out God’s will to do. This is one of the main lessons which Jesus repeated for his disciples when he was still living with them, “I do not seek My own will, but the will of Him who sent Me” (Jn 5:30, cf also 4:34 and 6:38). The beloved disciple is the first one to recognize Jesus and said to Peter, “It is the Lord.” When Peter heard this, he put on his cloak and jumped to the sea. Why did he put on his cloak and jumped to the sea? May be he wanted to pay respect to the Lord. Once more time, Peter recognized his weakness and shortcoming. In the journey of leading the early Church, Peter believed too much in his wisdom and power, he forgot about the source of wisdom and power comes from God. This miracle reminds Peter and all the Church’s leaders to always looking for and doing God’s will. (1) Christ doesn’t separate himself from his disciples after the resurrection; but he is still concerned with their problems and care for them. In today report, he concerned with their need of food. He set up fire to toast bread and to be ready for new caught fish so that they may have their meal after working all night long. (2) Christ always has a way to protect his Church and disciples: The strange thing in this miracle is not only at catching many fish but also at the net which is “full of one hundred fifty-three large fish. Even though there were so many, the net was not torn.” This can be the image of the Church. Christ still protects the Church from all the enemy’s jealousy and attack. More than two thousand years had passed, the Church is still standing firm from all the enemies’ attacks both from inside and outside; and shall be like that forever as he promised to Peter (Mt 16:18). This is the Eucharistic formula which the apostles are too familiarize with. Through this sacrament, Christ becomes one with us and works with us to face all sufferings and challengings of our life. Without this sacrament, we shall have no strength to overcome them. - Imitating Christ, we must always try to glorify God’s name, to help His kingdom to come, and to make His will be done on earth as also in heaven. - Christ never separates from us. He is still accompanying with the Church and with every of us to love, to care, to guide and to protect. were being neglected in the daily distribution. "It is not right for us to neglect the word of God to serve at table. and to the ministry of the word." and Nicholas of Antioch, a convert to Judaism. who prayed and laid hands on them. even a large group of priests were becoming obedient to the faith. embarked in a boat, and went across the sea to Capernaum. It had already grown dark, and Jesus had not yet come to them. The sea was stirred up because a strong wind was blowing. and they began to be afraid. But he said to them, "It is I. Do not be afraid." to which they were heading. Written by Fr. Anthony Dinh Minh Tien, O.P. I. THEME: How to solve difficult problems in life? Difficulty and conflict happen everywhere and in all generation, because as long as people live together, they shall have conflicts. How to solve problems when we face difficulties and conflicts? The angry people shall scream, quarrel or do anything to satisfy their tantrum. The quiet people shall withdraw and be content with separation. Both ways aren’t God’s ways because they didn’t help people to improve. Moreover, wherever people go, they still have to face conflicts. 1/ Reading I: Knowing how to wisely solve problems. (1) Recognition of the problem: People’s tendency is to protect those belong to their family, community and nation before others. This problem also happened between the Jews of different cultures: the native Jewish widows were provided better than the ones of Hellenistic culture. If the apostles didn’t solve this problem, the partiality and jealousy shall be more serious, lead to separation, damage the unity, and cause scandal for other faithfuls. (2) The resolution: The Twelve called together the community of the disciples and said, "It is not right for us to neglect the word of God to serve at table. Brothers, select from among you seven reputable men, filled with the Spirit and wisdom, whom we shall appoint to this task, whereas we shall devote ourselves to prayer and to the ministry of the word." One man can’t do everything, and isn’t good to do all by himself because it shall not have better result than many contributors. Moreover, the extension of God’s kingdom is the duty of all faithful, not just leaders. The apostles know how to set priority: the proclamation of the Good News is the first duty which can’t be neglected. To have people to care for the community’s needs, they need to have more deacons who must have necessary virtues. The apostles wisely let the faithful to involve in finding the candidates; then, they shall verify by laying their hands upon them and guiding them in serving the community. 1.2/ The hierachy of the Church is gradually established: “The proposal was acceptable to the whole community, so they chose Stephen, a man filled with faith and the holy Spirit, also Philip, Prochorus, Nicanor, Timon, Parmenas, and Nicholas of Antioch, a convert to Judaism. They presented these men to the apostles who prayed and laid hands on them.” These were the first seven deacons of the Church. Deacon Stephen shall be the first martyr who was stoned to death to witness for Christ which we shall hear about in coming day. 2/ Gospel: Do not be afraid when facing hardship in life. Difficulties in life can’t be lacking in the progress which helps people to reach their maturity. The difficulties can be sent by God to test people’s faith or caused by others due to living together. In today passage, the author wanted to emphasize the earlier. 2.1/ The apostles were afraid of the storm: This event happened right after Jesus’ multiplication of five loaves and two fishes to feed five thousand people and they wanted to make Jesus their king. Jesus commanded his disciples to go across the Galilee first, and he went to a mountain to pray. From the mountain of Tiberias region, Jesus could clearly see his disciples’ boat in the Galilean sea. Many authors of the holy songs compared the Church and human life as a journey to the heavenly destiny on a boat. 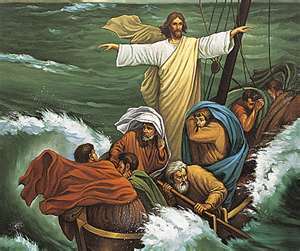 Jesus could foresee many difficulties which his disciples must face in leading the Church’s boat later, he wanted to prepare them by letting them face a violent storm in today event. From Tiberias, where they departed, to Capernaum, their destination, isn’t too far; but on that night, the sea was violent because of a strong wind. When they sailed about five to six kilometers, they saw someone who walked on the surface of water and approached them. This made them terrified because they never witnessed a man who walks on water. They thought that only a ghost can do it. Therefore, their fear was doubled. 2.2/ Jesus settled them down: He said to them: "It is I. Do not be afraid. "They wanted to take him into the boat, but the boat immediately arrived at the shore to which they were heading. Many times in Jesus’ public ministry, Jesus said these words to them. For examples, when he chose Peter to be the Church’s leader, he said to him: “So I say to you, you are Peter, and upon this rock I will build my church, and the gates of the netherworld shall not prevail against it” (Mt 16:18). Jesus’ last words to his disciples: “Peace I leave with you; my peace I give to you. Not as the world gives do I give it to you. Do not let your hearts be troubled or afraid” (Jn 14:27). After the resurrection, he appeared to them and the first words he said to them are: “Do not be afraid!” (Mt 28:10). When people live in his protection, there is nothing to be feared about. - When facing difficulty and conflict, both angry and withdrawing must be avoided. We need to combine both God’s spiritual help and taciful behavior to solve problem wisely and charitably. - All Christians have a duty in developping of God’s kingdom. Leaders need to be wise in guiding all faithful to have an opportunity to contribute according to their situation. - When the difficulties come, don’t be afraid; but to be patient, to pray, and to find a good resolution. When they heard this, they became infuriated and wanted to put them to death. I. THEME: People need to be humble so that they can recognize and accept God’s power. The universe is so immense while human intellect is so limited. If one can’t fathom what happen on the earth, how can he fathom what is in heaven? Therefore, people need to avoid the narrow minded as the frog sitting at the bottom of a well. Since, he can see only a limited sky as the well’s circle, he thinks he is the best. He doesn’t know that outside of the well is an immense universe! Moreover, the universe contains many powerful forces while human beings are so weak. If human beings can’t resist natural forces such as: storms, tonadoes, hurricanes, volcanoes, earthquakes, how could they oppose God’s power? If they are still stubborn to do so, they are like eggs throwing into a stony mountain! 1/ Reading I: One must obey God than human beings. In Jesus’ Passion and Death, all the apostles and the people of Sandherin denied and opposed God. However, God doesn’t condemn them; but He wants people to be responsible of their acts. If they were wrong, they must have courage to accept and to correct them; not to deny and to attribute their sins to others. 1.1/ The apostles had courage to express their faith in Christ: Though they denied and ran away from Jesus in his Passion and Death; but when Jesus appeared to them, they recognized their sins. After were confirmed by the Holy Spirit’s power, they courageously went out and witnessed for Christ before all people. 1.2/ The stubborn attitude of the Sandherin: They were already wrong the first time when they condemned Jesus and asked Pilate to crucify him, they didn’t accept their sins when the apostles witnessed for him. Instead, the high priest lectured the apostles: “We gave you strict orders (did we not?) to stop teaching in that name. Yet you have filled Jerusalem with your teaching and want to bring this man's blood upon us.” When the apostles responded that “we must obey God than men,” they became infuriated and wanted to put them to death. The apostles’ answer was so logical, especially for those who have responsibility to protect God’s law. They didn’t recognize the truth; instead, they let their pride and jealousy to rule their mind, and used their power to surpress the apostles. They thought that they were protecting the law, but they actually despised and violated the law. We can list several cases that they contempted the law: First, they condemned Jesus without proper investigation as required by the law. Secondly, they asked Pilate to crucify Jesus to the cross even Pilate, a Gentile, declared Jesus was innocent. Lastly, they threatened, scourged and wanted to kill two witnesses, Peter and John, when they witnessed for Christ. In a word, they despised the law which they have a responsibility to safeguard it; and they let their anger and jealousy ruled their mind so that they abused their power to surpress the innocent. 2/ Gospel: Whoever believes in the Son, has eternal life. 2.1/ Jesus revealed to men what is in God: The basic principle which people must humbly recognized, “The one who comes from above is above all. The one who is of the earth is earthly and speaks of earthly things. But the one who comes from heaven is above all.” Before Christ about 600 years, the prophet Isaiah also declared the same thing: “As high as the heavens are above the earth, so high are my ways above your ways and my thoughts above your thoughts” (Isa 55:9). The reason why the Jews didn’t believe in Christ because they believed only in the One God. Though they knew, according to the prophets, that God shall send the Messiah to redeem people, but they believed the Messiah shall use his power to save and govern them, not to humbly suffer as Christ did. Jesus explained for them the relationship between God and him, whom God sent to them; but they refused to believe in his word. Jesus reminded them that if they can’t fathom things which happen in the earth, how they can fathom things in heaven. 2.2/ The results of accepting or denying God’s Son: If a person accepts Christ as the one sent by God, he shall inherit eternal life, receive the Holy Spirit, and all blessings which the Father has entrusted to the Son. If a person refuses to believe in Christ as sent by God, he shall not have eternal life but God’s angry is heavily upon him. - We need to study to recognize God’s wisdom and power. We must also realize our limited knowledge and weaknesses. If we do these two things, we shall know how to rightly live to reach good results for our life. - Whoever declares he only believes what he can understand is arrogant and absurd. Arrogant because he claims that he can fathom all things in heaven and on earth; absurd because he doesn’t know his limitation and misses chances to learn new things. stood up, ordered the Apostles to be put outside for a short time, and said to the Sanhedrin, "Fellow children of Israel, be careful what you are about to do to these men. were disbanded and came to nothing. After him came Judas the Galilean at the time of the census. He also drew people after him, but he too perished and all who were loyal to him were scattered. have nothing to do with these men, and let them go. you may even find yourselves fighting against God." They were persuaded by him. to suffer dishonor for the sake of the name. And all day long, both at the temple and in their homes, they did not stop teaching and proclaiming the Christ, Jesus. "Two hundred days' wages worth of food would not be enough for each of them to have a little." Jesus said, "Have the people recline." so that nothing will be wasted." from the five barley loaves that had been more than they could eat. "This is truly the Prophet, the one who is to come into the world." I. THEME: If it comes from God, you will not be able to destroy them. Time is one of important elements to determine a truth. For examples, we need time to determine a watch that was made in Switzerland or China; to know what is a true or faked love; to determine a true or supertitious religion. When people want to destroy a sect, they normally kill its leader. Jesus also stated this fact: “When they kill the shepherd, the sheep shall be scattered.” But Catholic is an exceptional case; although they killed Christ, his sheep aren’t scattered but increased everyday. The Church’s presence is a powerful proof for Christ’s resurrection; Christ is still acting in the Church. Today readings want to prove God’s power. When He wants to do something, he shall finish it; no power nor difficulty can prevent God’s will to happen. In the first reading, Gamaliel, a Pharisee, advised the Sandherin to be careful in persecuting Christ’s disciples. According to his experience, let time to eliminate wrong groups. If a group isn’t in God’s plan, sooner or later it shall be disbanded; but if a group is formed according to God’s plan, human beings can’t destroy it. In the Gospel, when Jesus wanted to feed people, he found the way to get food although his disciples brought up many difficulties. When Jesus didn’t want people to make him their king, he went up to a mountain alone. 1/ Reading I: Let time eliminate falsity. 1.1/ Gamaliel’s wise thinking: He was a Pharisees, respected by all the people, and St. Paul’s teacher before his conversion (Acts 22:3). He ordered the apostles to be put outside for a short time, and said to them, "Fellow Israelites, be careful what you are about to do to these men. Some time ago, Theudas appeared, claiming to be someone important, and about four hundred men joined him, but he was killed, and all those who were loyal to him were disbanded and came to nothing. After him came Judas the Galilean at the time of the census. He also drew people after him, but he too perished and all who were loyal to him were scattered. So now I tell you, have nothing to do with these men, and let them go. For if this endeavor or this activity is of human origin, it will destroy itself. But if it comes from God, you will not be able to destroy them; you may even find yourselves fighting against God." They were persuaded by him because his opinion was based on experience and history. The apostles left the Sanhedrin, rejoicing that they had been found worthy to suffer dishonor for the sake of the name. All day long, both at the temple and in their homes, they did not stop teaching and proclaiming Jesus as the Messiah. (1) The apostles wanted Jesus to change his will: They might think that Jesus was like a rabbi; and his duty was to teach and to explain the law, not to feed people. This is the image of the sacrament of the Eucharist in the Fourth Gospel. Although John didn’t report Jesus’ institution of the Eucharist in the Last Supper, John used the formula of the institution and the discourse about this sacrament in chapter 6. Jesus wanted to establish the sacrament of the Eucharist to remain and to nourish people everyday. Like the apostles’ doubt, people of every generation continue to doubt about Jesus’ real presence; they think it is impossible to happen or just a symbol. They forget that nothing is impossible to God. When He wants, He has a way to do it. 2.2/ People wanted to make Jesus their king: When the people saw the sign he had done, they said, "This is truly the Prophet, the one who is to come into the world." The reason why they wanted Jesus to be their king was that he shall continue to give them food; but Jesus wanted them to work for food. When Jesus fed them, he nourished not only their body, but also increased strength for their soul so that they can overcome obstacles in their life. When Jesus knew that they were going to come and carry him off to make him king, he withdrew again to the mountain alone. He didn’t want to be their political king because they already had one; he only wants to be the king in their mind and in heaven. - When we meet difficulties in our apostolic works, we need to believe, “If our works come from God, no one shall be able to destroy them.” In other words, if our works are God’s works, He shall make us to be successful; if they aren’t God’s works, let them vanish. We should not be too worry. No one can resist God’s will. - We need to let time discard all counterfeit and falsity in life. We should not hastily follow new doctrine or fashion, and discard the basic standards of our religion, the good traditions of our Church, nation, and family. laid hands upon the Apostles and put them in the public jail. and tell the people everything about this life." they went to the temple early in the morning and taught. and sent to the jail to have them brought in. but when we opened them, we found no one inside." as to what this would come to. "The men whom you put in prison are in the temple area and are teaching the people." Then the captain and the court officers went and brought them, but without force, because they were afraid of being stoned by the people. I. THEME: People hate the light because their work is deceptive. God creates people who have capacity to know the truth. The main reason why people refuse to know the truth is that they want to stay in darkness so that others shall not recognize their suspicious work. Today reading want to show this darkness in human beings. In the first reading, out of jealousy, the high priests and the Sadducees wanted to put the apostles into prison. They were jealous because people left them to follow the teaching of the apostles. In the name of the law they wanted to put the apostles in prison; but in reality, they wanted to cover up their wicked desire. In the Gospel, after Jesus declared God’s love for people through the fact that He gave them His Only Son, he proceeded to explain why people refuse to come to the light is because they want to cover up their deceptive thought and deed. If they come to the light, others shall see their deceptive work, and their true identity shall lay bare for people to see. 1/ Reading I: Out of jealousy, they seized the apostles and put them into a public prison. 1.1/ The conflict between God’s power and human strength: God is the One who creates and controls this universe, and gives the earth for people to take care of; but many people are wrong when they think humankind is the owner of this world. Therefore, there always exists a conflict between God and human beings, people want to take God’s right to decide everything for themselves. One of these examples happened in the first reading. 1.2/ What should people do when there exists a conflict between God and the world? (1) The apostles chose to obey God’s command: They despised scourging and prison of the worldly power to preach the Good News as God’s messenger commanded them. Why could they do this while many others are afraid and run away? The answer is that the apostles realized that God’s power is much more powerful than human power. This was expressed through the fact that God’s messenger liberated them when the soldiers were guarding and the doors of prison closed. Moreover, the apostles recognized Christ’s truth and the Sandherin’s falsity. They probably asked themselves this question: why should they continue to be slaves for liars and not let the truth set them free? Therefore, when the opportunity came, they laid bare the lying and announced the truth. People also chose to follow the truth of the apostles’ teaching. In God’s providence, there is “nothing is concealed that will not be revealed, nor secret that will not be known” (Mt 10:26). The truth shall be revealed, people can’t cover up the truth for ever. Although people have little knowledge of the law, they can still have God’s widom to recognize the truth. They aren’t stupid to the point that the leaders can deceive them for ever. They recognized Jesus is the true Messiah whom God sent to redeem people; they also recognize the wicked act of the Sandherin, they killed Jesus out of their jealousy. Once people recognized the truth, the leaders who has done wrong, lost their trust; they must be careful because people could stone them. There exists a funny thing here: Instead the apostles must fear of them, they now feared the people to stone them. They probably recognized this strange, but didn’t pay attention to, because they were so used of surpressing the innocence by force! 2/ Gospel: Who does wicked things hates the light and does not come toward the light. God’s purpose when He sent His Son to the world is to redeem the world, not to judge the world. If a God who loves people to the point that He sacrificed His Only Son to them, this point showed that He doesn’t think of judgment, but only of redemption. If God doesn’t judge, why people are still lost? St. John answered: People judge themselves when they turn their back to God’s love and don’t believe in Christ. 2.2/ The conflict between light and darkness: First, it is a physical conflict which people can see. Jesus is like the light who comes to expel the darkness which is covering the world. People have freedom to choose, either to come up to the light by believing in Christ or to stay in the darkness by refusing to believe in him. It is this choice which a person can be saved or destroyed. 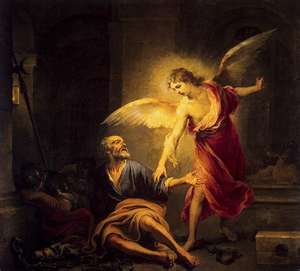 Behind this physical conflict is the moral conflict between good and evil, as Jesus said: “For everyone who does wicked things hates the light and does not come toward the light, so that his works might not be exposed.” Jesus wanted to say that the reason why people don’t accept the light, not because they don’t know the light is good and useful; but because there are wicked sins which people got so used to and don’t want to give up. If they choose to come up to the light by believing in Christ, they must give up these sins. Finally, it is a spiritual conflict between God and the world. God wants to save men while the devil and the worldly power want to draw people to themselves. In order to belong to God, people must “lives the truth by coming to the light, so that his works may be clearly seen as done in God." - We are always being put in a conflict between light and darkness, between God’s power and those of the devil and the world until the day we shall leave this world. - Jesus also foretold the victory if we choose to live according to God’s standard: “In the world you will have trouble, but take courage, I have conquered the world” (Jn 16:33).